set yourself up as an authority in your niche market: the better the quality of your posts and interactions in your communities, the more your brand gains credibility on G+. promote your brand: going back to the previous point,, your actions on Google+ do tell others a lot about your business. Your actions could promote your business for you. get more shares for your content: Google+ is a huge network. Sharing your content with the right audience increases its chances of going viral. improve user engagement with your brand: putting together a community for your brand to interact with your prospects and existing customers could get help you build a stronger connection with them. get involved in private discussions: want to discuss high level practices with your colleagues on G+? Private communities provide you with that environment. You will have an easier time staying focused on topics that interest you in these communities without having to deal with too much spam. organize your circles: joining the right communities could help you find the right people for all your circles. get your questions answered: have questions about running your business? Maybe you have specific questions for your customers or other players in your niche market. Communities are where you can get your answers through. answer other users’ questions: by answering other users’ questions, you not only build goodwill for your business, you get to set yourself up as an authority figure on G+. find content ideas: one of the best ways to find content ideas for your site is by paying attention to what people talk about in Google+ communities. discover product ideas: by listening to the needs and wants of people in Google+ communities, you will learn how to position your future products to address them. connect with the right professionals to expand your business: in order to grow your business, you are going to have to hire professionals. Google+ communities are filled with professionals who are looking for new opportunities. provide support for your customers: you should start a community for your brand and have a section for answering questions about the issues that concern your customers. Great customer service sets your business apart from others. spy on your competitors: if you are getting serious about using Google+ communities to grow your businesses, chances are your competitors are too. There is no reason you should not be spying on them. keep up with the latest developments and breaking news: this only works if you join large communities. But news do break quickly in top G+ communities. organize research ideas: you could uses your Google+ communities to organize your research. That depends on how well you organize the topics discussed in them though. write a book: it is possible to get book ideas by interacting with others on Google+. Studying the content shared on G+ community pages could further help you with that. catch up with related events: many communities have a section to track the latest events related to their topic. You don’t want to miss those. get product suggestions: already have a few products available for sale? You could always gain feedback or enhancement suggestions through your community on G+. Watching communities covering products that compete with yours could be worth your time. beta testing and debugging: when you are preparing your product for a public release, chances are you won’t be able to catch all the bugs by yourself. By leveraging your community on Google+, you might find people to help test your product and offer you with feedback on bugs. 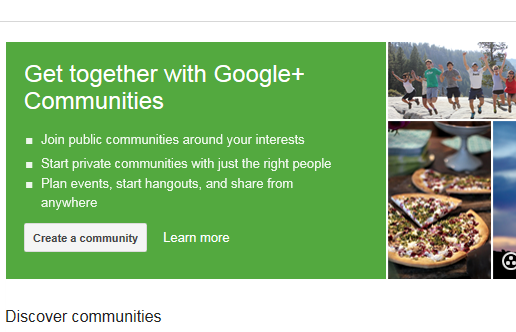 Google+ communities are here to stay. By staying active in them, watching the activities within them, and starting your very own communities, you can grow your business, promote your brand, and drive more traffic to your site while reducing your costs. It is a strategy worth pursuing for small businesses.